That is quite an assortment of wrestlers. It should be noted this will mostly be a playful affair as Mio is a playful person, so this isn’t an event aiming for your traditional Five Stars Classic matches. All Joshi wrestlers listed above have profiles on Joshi City, you can click on their name to go straight to it. Lets get rolling. While most promotions start events with the younger wrestlers, Marvelous frequently does things different as they kick off with the older crew. The teams are a bit jumbled from the norm, as Chikayo Nagashima, DASH Chisako, and Megumi Yabushita are all in the W-FIX faction while Yuu Yamagata is in LEVEL-5. I’m sure Mio has her reasons. Most of these wrestlers are in the twilight of their careers (except Chisako) but they still know how to put on a good show. This match is under High Speed Rules, which are confusing but require running off the ropes regularly, particularly before attempting a pin or submission for victory. Chisako and Megumi attack from behind before the match officially starts and they start double teaming Chikayo. They do a moment to imitate Mio Momono’s pose and Chikayo takes advantage, kicking both of them and leaving just Megumi in the ring with her. Megumi runs the ropes but Chikayo trips her, kicks by Chikayo but Megumi rolls her up for a two count. Megumi runs the ropes again but Chikayo does too until Megumi sneaks away to tag in Chisako. Chikayo and Chisako lock knuckles, wristlock by Chikayo but Chisako gets out of it. 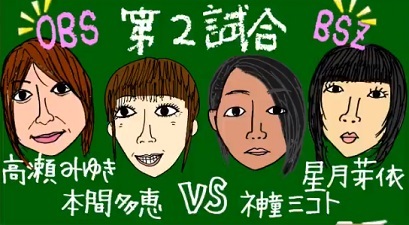 Yuu and Megumi both come in the ring, Yuu leaves after a moment and Megumi runs the ropes with Chisako and Chikayo. Now Chikayo runs the ropes and hits a vertical suplex, cover by Chikayo but it gets a two count. Chikayo and Chisako both grab chairs, Chikayo knocks away Chisako’s chair but Chisako dropkicks Chikayo’s own chair into her. Facebuster by Chisako to Chikayo, she goes off the ropes and hits a footstomp. Chisako tags Megumi and Megumi whips Chikayo in the back with a belt. Chikayo eventually slides away from Megumi’s belt and hits a tilt-a-whirl headscissors, dropkick by Chikayo but Chisako comes in to help her partner. Yuu tries to help Chikayo also but it backfires and Megumi puts Chikayo in a submission hold, but she needs to run the ropes before winning. She does as Chikayo gets up, both both of them get tired from the rope running. Chikayo jumps up in the corner and applies a hanging headscissors, Chikayo goes off the ropes and puts Megumi in a Stretch Muffler, but there wasn’t enough rope running so the referee doesn’t react. Megumi gets up, runs the ropes a few times and lets Chikayo put the move back on, but Chisako breaks it up. KAORU comes in the ring and runs the ropes before leaving, as Yuu is finally tagged in. Yuu puts Megumi in a leg lock and grabs Chisako when she comes in, hitting a vertical suplex. Megumi gets away from Yuu and tags Chisako, Chisako goes to the top turnbuckle and connects with the missile dropkick. Dropkick in the corner by Chisako and she kicks Yuu down near the corner, she goes up top again but Chikayo runs over and prevents her from jumping off. Megumi goes over and gets rid of Chikayo, Hormone Splash by Chisako but Chikayo trips her when she goes off the ropes. Chisako goes for a German suplex, Chikayo tosses Yuu a belt to try to guide her to the ropes but the idea doesn’t work. Yuu gets mad so Chikayo whips her, Chikayo hits a diving footstomp on her own partner and Chisako follows up with an assisted splash. All three of them run off the ropes and do Mio’s pose, Chisako goes off the ropes again and she attempts to cradle Yuu, but Yuu reverses the cradle into her own three count victory! Yuu Yamagata (and technically Chikayo Nagashima) are the winners. This was an interesting idea as in a way its a parody of a comedic wrestling match, taking it to the next level of ridiculousness. The wrestlers didn’t really want to be in the match but they made the best of their situation, and the mixed teams almost made it through the match before things broke down. So clearly this was a silly match, your mileage will vary on if it was good but it was definitely unique to see them try to pull off a High Speed match with some success but mostly awkwardness and confusion. Perfectly fine for an opener. Now we get to the youngsters. Mikoto and Mei both debuted in Marvelous in the last year, and while they aren’t at the level of Big Rookie Utami Hayashishita of Stardom, they have shown a lot of early promise and could develop into stars if they keep at it. Tae and Miyuki both are from Actwres girl’Z, a small promotion that Marvelous is on good terms with and frequently uses their wrestlers. 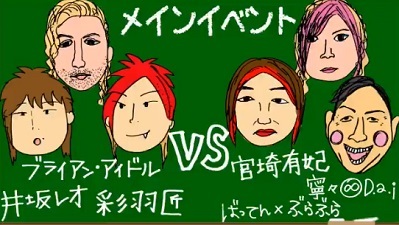 Tae and Miyuki do have the experience edge, but not by much, so it should be a fun match. Miyuki and Tae kick their opponents before the match starts, Mikoto is knocked out of the ring and Miyuki stays in to focus on Mei. Scoop slam by Miyuki and she starts on Mei’s back, she tags in Tae and Tae continues where she left off. Mikoto comes in to help by making loud noises with a spoon and pan, giving Mei time to tag her in, and together they dropkick Tae. Mikoto puts Tae in the ropes but Miyuki runs in to help. Miyuki gets put in the ropes too by both rookies and they rub washcloths into their face for reasons I’m unsure of. But it doesn’t look pleasant anyway. Mei and Mikoto both deliver dropkicks, cover by Mikoto but Tae kicks out. Scoop slam by Mikoto and she puts Tae in a camel clutch before Mei comes in and puts a frying pan on her head before hitting the pan with a ladle. Mikoto tags Mei, Mei hits a series of dropkicks on Tae for a two count. Tae flips Mei onto the apron but Mei lands on her feet and slides under the bottom rope, dropkick by Mei but Tae has had enough and hits a series of elbows. Running elbow by Tae in the corner, Miyuki tosses Tae a hand brush and she uses it on Mei’s face. Tae gets a marker and draws on Mei’s face as well. Snapmare by Tae and she dropkicks Mei for a two count. Armbar by Tae but Mei gets a foot on the ropes for the break, dropkick to the back by Tae and she tags in Miyuki. Miyuki goes out to the apron and chops Mei repeatedly in the chest, back in the ring she hits a scoop slam before covering her for two. Miyuki goes off the ropes but gets tripped, Mei gets the frying pan but Miyuki blocks her from slamming her onto it. Miyuki picks up Mei and slams her onto the pan, she picks it up and tries to bend it, but can’t. She tries to hit Mei but Mei steals it from her and hits Miyuki in the head. Mei gets the marker and draws on Miyuki’s face, dropkicks by Mei and Mikoto to Miyuki and Mikoto covers her for a two count. Mikoto grabs the ladle and hits Miyuki in the leg with it, Miyuki elbows Mikoto into the corner but Mikoto schoolboys her for two. She goes for a few more flash pins with no luck, she goes off the ropes but Miyuki levels her with a lariat. Miyuki picks up Mikoto and hits a rolling fireman’s carry slam, she gets on the second turnbuckle and nails the guillotine leg drop, but Mei barely breaks up the cover. Miyuki picks up Mikoto and deliver the spinning Samoan Driver, and she picks up the three count! 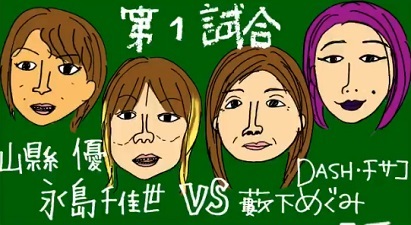 Tae Honma and Miyuki Takase win! While I can’t explain the meaning behind the various “weapons” used in this match, when they were focused on the wrestling itself you can tell that all four have a lot of potential. They are all young and early in their careers but their timing is on-point and they show an ability to entertain both with their in-ring work and playing with the crowd. In a normal situation I wouldn’t have minded a bit more “substance” so they could show off a bit more, but on a show booked by Mio Momono its going to be more carefree just be default. Decent enough, although nothing overly memorable. I kind of feel for Rin Kadokura in this match. Handicap matches with veteran vs. rookies aren’t completely unheard of in Joshi circles but Rin Kadokura is no rookie, as she has been wrestling for almost three years and has had title success. So while her partner is in the main event slot, here she is teaming with a child rookie and a virtual unknown to the Joshi crowd. Ray Lyn actually has been wrestling for seven years but mostly for smaller promotions, although she did start wrestling in RISE last year. Still, its an oddly paired grouping. The match does have regular tag rules however, with only one wrestler from the younger team allowed to be legal at a time. KAORU is jumped by all three before the match starts but they miss a triple dropkick which gives KAORU time to get her board. Rin dropkicks the board back into her before Maria and Ray hit dropkicks as well, Maria and Ray leave the ring to leave Rin as the legal wrestler. Rin tags in Maria but KAORU boots her in the chest, vertical suplex by KAORU and she covers Maria, but Rin breaks it up. KAORU and the rest of W-FIX pose with Maria in the ropes, but Rin and Ray come over and break things up. Maria dropkicks KAORU in the back as does Ray, Rin follows with her own dropkick and Maria covers KAORU for two. Ray is tagged in, kick combination by Ray and she hits a seated senton for two. Ray gets KAORU in the corner and hits a running knee, she goes up top and hits a missile dropkick for another two count. Ray goes off the ropes but is tripped from the floor, KAORU knocks Rin and Maria off the apron and W-FIX attacks all three around the ring while KAORU rests inside. They eventually all get back into the ring as the W-FIX assault continues, they finally leave the ring and KAORU suplexes all three of her opponents on the mat near the corner. KAORU then goes up top and nails the Valkyrie Splash on all three of them, cover on Ray but she kicks out at two. Ray recovers and kicks KAORU in the head, she tags in Rin and Rin comes in the ring with a missile dropkick. Northern Lights Suplex by Rin, but Chikayo Nagashima breaks it up by throwing a chair at her. Rin is sat down in the chair and kicked by Nagashima, Chisako, and Yabushita, delayed brainbuster by KAORU but Ray breaks up the cover. KAORU puts Rin on the top turnbuckle and tries to join her, but Maria and Ray pull her back to the mat, allowing Rin to hit a missile dropkick. Chisako hits a missile dropkick to Rin’s back, Ray and Maria try to help but Chisako dropkicks them as well. Maria tags herself in, double vertical suplex to Maria, and KAORU covers her for two. Irish whip by KAORU to Maria but Rin grabs her from the apron, allowing Maria to hit a dropkick. More dropkicks by Maria and she hits a body slam, she goes off the ropes but Yabushita whips her from the floor. Ray and Rin come in, KAORU eats a double superkick and Rin goes up top, hitting a missile dropkick onto KAORU. Maria goes for flash pins but KAORU kicks out of each one, Chisako and Nagashima both return and suplex Rin and Ray from behind. 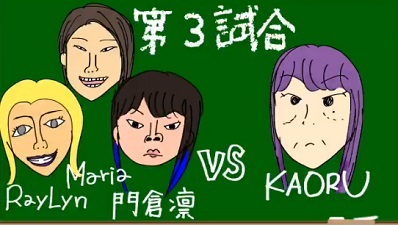 Maria grabs KAORU and hits a scoop slam, but KAORU bridges out of the pin and rolls up Maria for the three count! KAORU is the winner. When this match was announced it was a bit confusing, since ZAP is usually Tomoko Watanabe under a mask, so we knew Mio Momono had a trick up her sleeve. And sure enough she did, as “Tomoko Watanabe” turned out to be Sakura Hirota cosplaying as her while ZAP actually was Tomoko Watanabe herself played the role of ZAP. Sakura comedy matches are hit and miss with me but they work best when she is cosplaying as the wrestler she is up against, as it can lead to some funny spots. This is more just the comedy relief before the main event, so hopefully it has a few chuckles in it. I will say I have respect for wrestlers that don’t mind wrestling Sakura Hirota wearing a fat suit making fun of them. They talk for a bit before ZAP gets mad and starts tossing “Watanabe” around, but “Watanabe” comes back with a face crusher and does the Mutoh pose. Irish whip to the corner by “Watanabe” but she takes too long to do a move and ZAP kicks her. Scoop slam by ZAP but “Watanabe” avoids the leg drop and runs the ropes over her, she goes to fall onto ZAP but ZAP gets her feet up. “Watanabe” stays on the mat and encourage ZAP to go off the ropes and jump over her, which she finally does, but “Watanabe” gives her a quick Oil Check and rolls up ZAP for two. Face crusher by “Watanabe” and she grabs ZAP’s arm, she goes and walks the ropes but eventually slips and crotches them. ZAP goes off the ropes but “Watanabe” drop toeholds her into them, “Watanabe” sets up ZAP in the ropes and delivers a running Oil Check. ZAP rolls out of the ring and “Watanabe” goes off the ropes, but she gets stuck in the ropes while going for a dive. ZAP takes “Watanabe” up into the stands and beats her up, she finally rolls her back into the ring but “Watanabe” pushes her off and hits few headbutts. She knocks herself out doing this, ZAP picks up “Watanabe” and throws her to the ropes, “Watanabe” goes for a springboard move but ZAP moves. “Watanabe” goes for an Oil Check but “Watanabe” flips her off of her, Lariat by ZAP but “Watanabe” kicks out. ZAP picks up “Watanabe” and goes for a powerbomb, but “Watanabe” is too fat and falls on top of her. “Watanabe” kisses ZAP, she goes off the ropes but ZAP falls on top of her due to the kiss and “Watanabe” gets pinned for the three count! ZAP wins! For what it was, this was fine. I’m not the biggest fan of Sakura Hirota but her cosplay matches are pretty harmless. They all follow the same pattern and have the same spots but the live crowd always enjoys it so it has its place. A bit interesting just to see Tomoko Watanabe playing along but that’s about it for me. This is a unique collection of wrestlers for the main event, to say the least. Takumi Iroha is the young ace of Marvelous and Yuki Miyazaki is a Freelancer that goes everywhere, so those two are pretty normal. Leo Isaka is the top male wrestler in Marvelous and frequently gets higher spots on the card, even though he isn’t as well known outside of the Marvelous circle. From there things go sideways. Bryan Idol is joining Takumi and Leo, he’s an American Freelancer that recently has had a run in FIP plus a few spots in EVOLVE but generally hangs out in smaller promotions. Nene D.a.i. is a cross-dressing wrestler from Triplesix, while Batten BlaBla wrestles out of Kyushu Pro Wrestling. I have no idea the connection that got Nene and Batten in the main event slot, nor have I seen either wrestler before, so hopefully this unusual combination of wrestlers puts on a good show for Mio. Takumi and Batten start the match, Takumi throws down Batten by the hair and kicks him in the corner. They trade holds, Takumi gets the better of it as Batten wiggles around on the mat, which Takumi has no time for as she throws Batten in the corner so her team can all hit running elbow strikes. Cover by Takumi, but it gets two. Takumi tags Leo, Batten chops Leo in the throat and stomps on his chest. Batten tags Nene, Nene and Leo trade elbows and armdrags before reaching a stalemate. Idol and Yuki are tagged in, Yuki kicks Idol in the shin and puts Idol in the crotch stretcher, Idol gets out of it and Yuki quickly tags in Batten. Batten and Idol mess around a bit until Batten throws Idol in the corner and delivers a running chop to the throat. Batten goes off the ropes and hits a lariat, cover by Batten but it gets two. Batten tags Nene, Nene gives Idol a kiss which leads to Idol chopping him to the mat. Nene goes for an inside cradle but Idol blocks it and hits a suplex, knees by Idol and he hits a double underhook suplex. Idol tags Leo, Idol picks up Leo and tosses him down onto Nene. Leg sweep by Leo and he connects with a running knee, he goes for a springboard move but Nene catches him with a cutter. Scoop slam by Nene, he goes up top and hits a slingshot crossbody for two. Nene tags Yuki, sliding kick by Yuki but Leo gets Yuki’s back. Yuki gets away but Leo connects with a step-up enzuigiri and tags in Takumi. Yuki suplexes Takumi and drives her face repeatedly into her rear, Leo comes in but he gets the same treatment. Idol felt left out and comes in, he gets on the mat and gets it as well. Yuki goes out and gets Mio Momono, she brings her into the ring and grabs her by the end with her legs, driving her head into her rear end as well. Mio is unconscious and is rolled nicely back out of the ring, Takumi kicks Yuki in the leg but Yuki goes for a kiss, which is blocked. She blocks it a second time and punches Yuki in the face, kick combination by Takumi and she goes off the ropes, but Yuki catches her with a Samoan Driver. Leo runs in and hits a sliding kick on Yuki as things break down, Idol comes in too and he spears Batten off the apron. Leo gets on the top turnbuckle and dives out of the ring with a moonsault, Idol rolls in Batten and he covers him for two. Not sure how they are legal but we have loose rules here. Batten chops Idol in the throat but Idol catches him with a tombstone piledriver. Idol runs to the corner and goes for a moonsault, but Batten rolls out of the way. Takumi tags back in and hits a head kick, missile dropkick by Leo to Batten and Takumi hits a vertical suplex. Takumi goes up top but Yuki comes in and joins her, Yuki kisses Takumi before hitting a superplex. Nene comes in and picks up Takumi, scoop slam by Nene and he hits a somersault senton for two. Headscissors by Nene, Batten and Yuki both come in and go for elbow drops but Takumi kicks them both back. Takumi hits a low blow on all three of her opponents, buzzsaw kick to Batten but Batten barely kicks out of the cover. Takumi goes up top and nails the Swanton Bomb, and she picks up the three count! Bryan Idol, Takumi Iroha, and Leo Isaka are the winners. There is a lot to unpack here. First, its an absolutely bizarre combination of wrestlers, which is part of the charm but will also leave most Western fans confused as these are not wrestlers most people are even familiar with. I don’t know the real life connection or how they ended up here but it definitely gave the match a unique feel. I wouldn’t say most of the in-ring work was crisp, although Idol hit all his spots well and left a positive impression. I also liked Mio getting involved, even if not necessarily by choice, since it was her show after all. Much of this match was pretty uneventful however as aside from a few memorable spots not a lot was happening that sticks in your brain. There was no rhyme or reason to it whatsoever and tags meant nothing, it was more like Mio Momono’s brain just exploded in the ring and this is what hopped out of it for reasons unknown. A unique spectacle but not something I could ever put a rating on. This is one of those types of shows I really don’t even like doing a traditional rating for as it was not designed to be a traditional event. Every match was nutty in its own way, there was very little “serious” wrestling on this card so if you are a purest (which I typically am) you will likely come away not overly amused. But its hard to hate on a show that made Mio Momono so happy, and it definitely was unique which in today’s age is worth something. I’m not sure if I would recommend this show or not, but if you enjoy wrestling that is a bit out in left field, you’ll enjoy this event.